I don’t know about you, but when I was a child I liked to make mud pies, walk around barefoot and climb any tree I could find. Instinctively I craved to immerse myself in the natural environment. According to Mary Ruebush PhD, author of Why Dirt is Good: 5 Ways to Make Germs Your Friends, the attraction is based on millions of years of evolution. Just like any other muscle in our body, the immune system needs to be exercised in order to fully develop and become strong enough to resist illness and disease. Eating dirt as a child turns out to be the ideal training to build your immune system’s overall fitness. New research says that it is possible that children today are ‘too’ clean, and would be better off sticking to their natural instincts. By no means am I suggesting that you feed your child spoonfuls of dirt, rather I am letting you know that you can stop worrying about dirt and germs and place your energy elsewhere. People are so worried about their children catching a cold or flu that they are obsessively focused on whether their child is clean and germ-free. However, this seems to work against the natural rhythm of life. 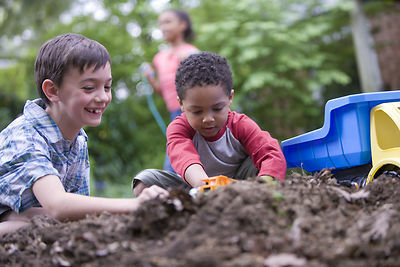 Science has proven that exposure to dirt is beneficial to a child’s life. They love dirt because they instinctively know it is good for them in order to grow up with strong immune systems. Alex is a true Earthie Mama, helping others tune into their most natural state while bringing harmony and balance into all areas of their lives in order to thrive. Alex has a well known blog on health, wellness, conscious parenting, green living and getting off the grid to self sustainability: earthiemama.com. She also has an MA in Psychology, and is a registered Yoga Instructor, environmentalist, conscious mother, green living expert and birthing expert, and sells all natural products and her ebooks through her website. Please check out her website at earthiemama.com or find Earthie Mama on Facebook page at Facebook.com/TrueEarthMama.